Visiting Boston and want to find somewhere to look at beautiful flowers? Head to the Boston Public Garden and Revere House. Not only will you be able to view stunning floral gardens and arrangements, you’ll have the opportunity to learn a bit about Boston’s history and the history of the United States. 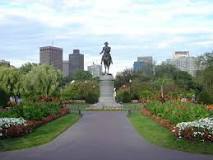 The Boston Public Garden first opened for public use in 1837. From the beginning, the botanical garden was decorated with beautiful flowers to enliven the spirit, which it still does today for many Boston Visitors. With tranquil meandering paths and floral exquisites of all kinds, the Public Garden has a long history of treating Boston Visitors to showy annuals and greenhouse plants that vividly display breathtaking colors and structure. Boston’s Public Garden was ushered in by the Victorians, and it currently features most of the same garden art that some critics find brash but many Boston Visitors truly adore. When you’re spending the Holidays in Boston, you’ll find some amazing seasonal flowers and trees at the Public Garden, as well lovely monuments, fountains, and even a lagoon that hosts Swan Boat races. More than 80 species of plants are cultivated in the Public Garden’s greenhouses, by the Boston Parks and Recreation Department, which are used for future plantings in more than 50 other locations in the city. Visiting Boston and want to find somewhere to look at beautiful flowers? Head to the Boston Public Garden and Revere House. Not only will you be able to view stunning floral gardens and arrangements, you'll have the opportunity to learn a bit about Boston's history and the history of the United States.